The phrase Shifting Baseline Syndrome describes an incremental eroding of standards that results with each new generation lacking knowledge of the historical, and presumably more natural, condition of the environment. Each generation then defines what is ‘natural’ or ‘normal’ according to current conditions and personal experiences. The ‘salmon crisis’ in the late 1990s galvanized awareness in BC that our baseline was shifting, suddenly and dramatically. In response, governments recognized the need to restore and protect watershed and stream health. This recognition resulted in development of the Water Balance Methodology. 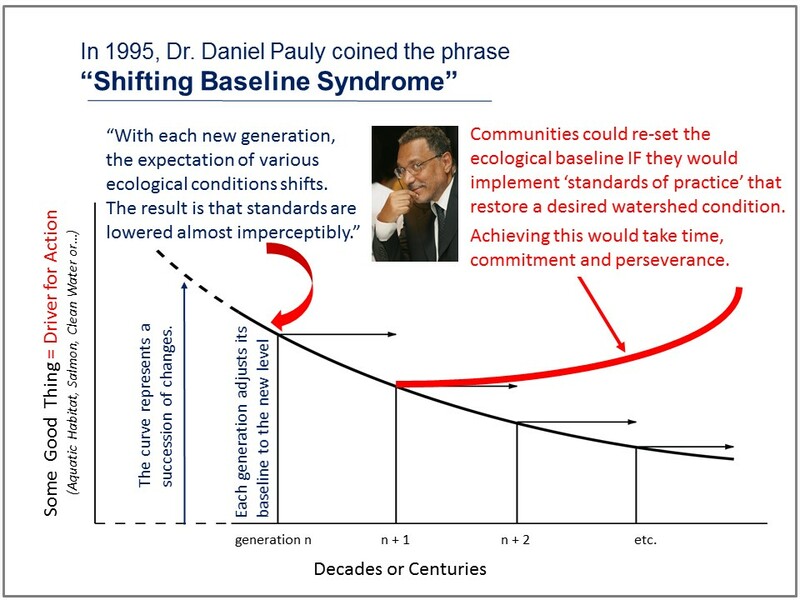 Dr. Daniel Pauly, a distinguished marine biologist, developed the concept of the Shifting Baseline Syndrome to describe why each new generation lacks direct knowledge of the historical condition of the environment, and how this lack of understanding plays out as a ‘failure to notice change’. Daniel Pauly is a world renowned fisheries scientist. He currently serves as the Principal Investigator of the Sea Around Us Project at the University of British Columbia’s Institute for the Oceans and Fisheries. His global, multi-year analyses of marine ecosystems have allowed him to reach startling and important conclusions – most critical among them that fish populations are declining rapidly all over the world. Awareness of shifting baselines in BC has been reflected in a number of landmark processes, including the Agricultural Land Reserve Act (1972), Fish Protection Act (1997) and Water Sustainability Act (2014). Dr. Pauly developed the concept in reference to fisheries management in a one-page paper titled Anecdotes and the shifting baseline syndrome of fisheries, published in 1995. A shifting baseline (also known as sliding baseline) is a type of change to how a system is measured, usually against previous reference points (baselines), which themselves may represent significant changes from an even earlier state of the system. The concept first arose in landscape architect Ian McHarg’s 1969 manifesto Design With Nature in which the modern landscape is compared to that on which ancient people once lived. Daniel Pauly then developed the concept in reference to fisheries management where fisheries scientists sometimes fail to identify the correct “baseline” population size (e.g. how abundant a fish species population was before human exploitation) and thus work with a shifted baseline. Daniel Pauly describes the way that radically depleted fisheries were evaluated by experts who used the state of the fishery at the start of their careers as the baseline, rather than the fishery in its untouched state. Areas that swarmed with a particular species hundreds of years ago, may have experienced long term decline, but it is the level of decades previously that is considered the appropriate reference point for current populations. In this way large declines in ecosystems or species over long periods of time were, and are, masked. There is a loss of perception of change that occurs when each generation redefines what is “natural”. A backgrounder that builds on the work of Dr. Daniel Pauly was prepared by the Partnership for Water Sustainability to help inform knowledge-sharing via the Across Canada Workshop Series that the Partnership undertook in 2014. The concept of “Shifting Baselines” has relevance in helping to understand why drivers for “Resilient Rainwater Management” differ across Canada’s diverse landscapes. 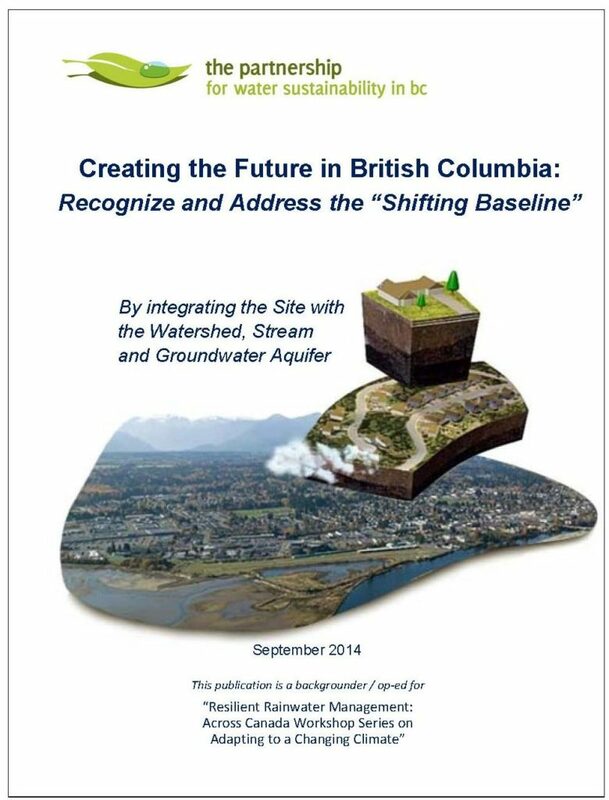 To download a PDF copy, click on Creating the Future in British Columbia: Recognize and Address the “Shifting Baseline”. In 2002, film-maker and former marine biologist Randy Olson broadened the definition with an op-ed in the Los Angeles Times newspaper. He explained the relevance of the concept to all aspects of change and the failure to notice change in the world today. “If we know the baseline for a degraded ecosystem, we can work to restore it. But if the baseline shifted before we really had a chance to chart it, then we can end up accepting a degraded state as normal — or even as an improvement,” wrote Randy Olson. “Communities can shift the ecological baseline upwards; they can replicate a desired watershed condition. This requires commitment and time,” stated Kim Stephens, Executive Director with the Partnership for Water Sustainability in British Columbia. Released by the Partnership for Water Sustainability in November 2015, Beyond the Guidebook 2015: Sustainable Watershed Systems, through Asset Management introduced Dr. Daniel Pauly’s Shifting Baseline Syndrome to British Columbia audiences to explain why communities unwittingly accept incremental and cumulative environmental degradation. Beyond the Guidebook 2015 then adapted this thinking to focus on how communities can turn the clock back to replicate desired conditions. Accepted ‘standards of practice’ – especially those for engineering, planning and finance – influence the form and function of the Built Environment. The goal of shifting to an ecologically functioning and resilient baseline and creating a watershed legacy will ultimately depend on the nature of change to standards of practice.